The 2010 criteria addressed a number of problems with the 1990 criteria. The TPE is eliminated in this criteria. A physical examination item, replaced by the widespread pain index (WPI), a 0-19 count of the number of body regions reported as painful by the patient. In addition, the 2010 criteria assessed on a 0-3 severity scale a series of symptoms that were characteristic of fibromyalgia: fatigue, non-refreshed sleep, cognitive problems, and the extent of somatic symptom reporting. The items were combined into a 0-12 Symptom Severity (SS) scale. Finally, the Widespread Pain Index (WPI) and SS-scales could be combined into a 0-31 fibromyalgianess scale, a second measure of polysymptomatic distress or FM severity (3). The criteria committee considered that the diagnosis of a symptom severity disorder should require more than an ‘augenblick’ diagnosis. Instructions, a criteria worksheet, and a patient pain location report are available on-line as an aid to ACR2010 assessments (www.arthritis-research.org/research/fibromyalgia-criteria). Wolfe F1, Clauw DJ, Fitzcharles MA, Goldenberg DL, Katz RS, Mease P, Russell AS, Russell IJ, Winfield JB, Yunus MB. The American College of Rheumatology preliminary diagnostic criteria for fibromyalgia and measurement of symptom severity. Arthritis Care Res (Hoboken). 2010 May;62(5):600-10. 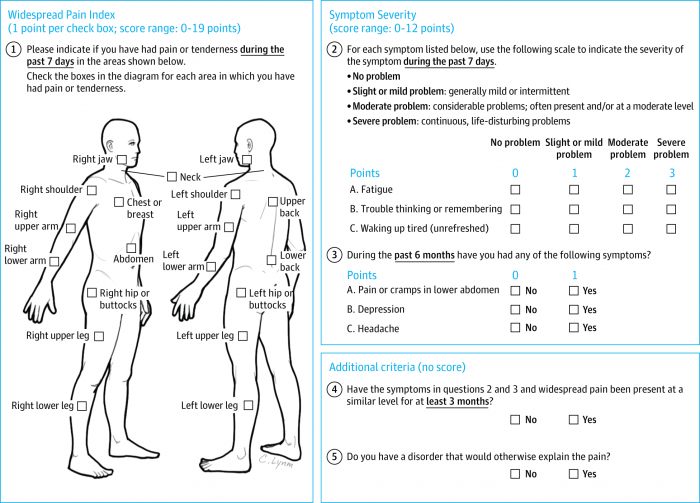 Diagnosis of Fibromyalgia: Disagreement Between Fibromyalgia Criteria and Clinician-Based Fibromyalgia Diagnosis in a University Clinic.